The Ruger® Elite 452® AR-Trigger is the perfect upgrade for any Modern Sporting Rifle*. including the Ruger® AR-556®, SR-556®, and SR-762®. This new two-stage trigger offers a smooth, crisp, 4.5 lb. trigger pull and a lightweight hammer that enables a 30% faster lock time over standard MSR triggers. The Ruger® Elite 452® also features a full-strength hammer spring for consistent primer ignition and includes a safety selector and all necessary pins and springs for easy installation. 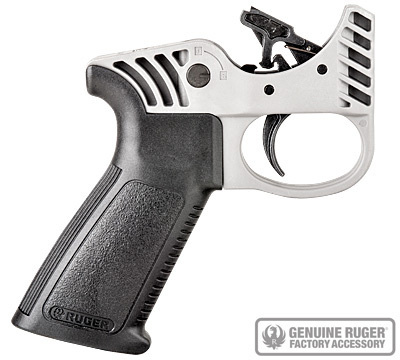 Packaged with an ergonomic, optimized trigger-reach, polymer pistol grip, the Ruger® Elite 452® is shipped fully assembled in a polymer fire control housing which allows the trigger to be dry-fired prior to installation, and the assembly can also serve as a trigger manipulation training tool. As an added benefit, the pistol grip and safety selector switch packaged with the trigger can be installed on any Mil-Spec AR rifle lower as replacement parts. * Fits any MSR receiver with .154" trigger/hammer pins. Great trigger, right out of the box. My 452 trigger came standard in my new SR556. I found it to be better than many triggers that cost twice its price. The trigger has only a slight and light take-up followed by a smooth and silent release. After a few test and practice shots, youll be able to take advantage of its crisp let-off. Its a keeper. This was a total splurge. My wife can never figure out what to get me for the holidays. Most of my toys are too expensive. I asked for this. I have a stock Ruger 556 and using a bipod put 40 rounds in a 2 1/2 x 2 1/2 inch pattern at 75. You could count 7 holes plus the area where most of the rounds went in the same place. I installed the elite today and went to the range. I put 100 rounds into a 1 3/4 x 1 3/4 inch pattern. There were only 10 discernable holes beside the primary entry area. A definite improvement. The trigger pull is smooth. Unlike the factory trigger on most shots I had no idea when it was actually going to fire. Unlike 2 stage triggers I m used to in hand guns there is not a huge amount of slack which is no problem. I am very pleased with this upgrade and would recommend it. I am not a gun enthusiast and would not spend hundreds of dollars on any upgrade. For the price this is an excellent option. After seeing all the good press, and wanting a two-stage trigger that fell between the normal lousy AR triggers and an all-out race trigger, I decided to use it in my AR-15 build. I got a very clean, shortened trigger light enough to compete with in 3-Gun in the local matches yet be heavy enough to be safe for every day use. I bought a second one for my next AR-15 build. Just tried out my new trigger today works great nice feel. smooth action. Could have used little better photos on assembly instructions. Just a tiny bit of take up then a nice light pull and snap. This is just what I was looking for. Replaced stock trigger in earlier build SR556, certainly a huge improvement going from 8+ pound creepy pull to smooth 4ish pound pull. Feels almost as good as the Timney trigger in my 10/22 that cost over twice as much. Just installed the ELITE 452 AR TRIGGER and it exceeded my expectations. CLEAN TAKE-UP and nice no-creep break. It was not too difficult to install if you have several punches to help guide the pins into place. One thing I did was to use the stock disconnector spring as it is flared at the base and stays in place better than the one supplied with the kit which is not flared when installing the trigger. I put the original parts into the supplied pistol grip so they would not get lost. They fit ok, however you cannot install the safety selector in the pistol grip as the stock trigger has a longer base and it will not fit, boo-hiss..Over-all I am totally satisfied and would recommend this to anyone, Light enough for target shooting and heavy enough for hunting. After watching hours of YouTube videos and reading multiple reviews, I decided to buy an SR-762. Many, many people in their reviews stated what an atrocious trigger the rifle had. Well, I purchased the gun on GunBroker, so I couldnt test the trigger out for myself. Imagine my delight when it arrived and I found this jewel installed. I guess in the early production models, they were using a different, mil-spec trigger group. 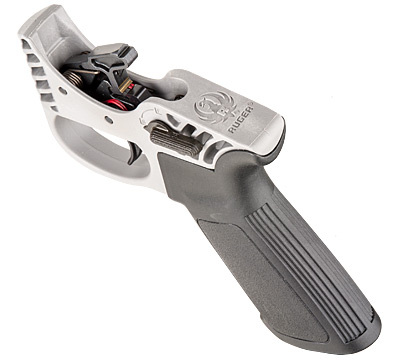 It seems Ruger has upgraded the standard trigger from the factory to the to the Elite 452. I have a Colt HBAR Target and a Bushmaster carbine, both with mil-spec triggers, and the Elite 452 in my SR-762 is miles and miles beyond the other two. I dont know if I would call the Elite 452 quite match grade, but I would be completely comfortable saying that it approaches match grade. I dont have a trigger scale, but compared to the X40 trigger in my Remington, I honestly believe that my SR-762s trigger breaks somewhere around 3.5 pounds. If you are looking for a very fine trigger for much less money than some of the other drop-in units, I would very strongly suggest giving this one a try. My AR-556 now has this trigger, and is an absolute joy to shoot. The stock trigger opened my groups up to over 1 MOA, and with this one I can keep them close to 1/2 MOA. Received trigger yesterday only 6 days after order. I have never worked on an AR before so I watched a You Tube video and followed the instructions provided by Ruger. Everything went as it should and the new trigger is a vast improvement on the original on my Bushmaster. The trigger is a perfect addition to an AR build. Its cost effective, relatively easy to install, and as good as it says. Ill be buying more. Very ratty trigger. Would expect much better from Ruger. Took it out and put my original back in that I tuned myself. Dont waste your bucks on this item. What an improvement at a good price. Consistent break at just under 4lb. This trigger group rivals $200-$300 trigger groups, the take up is smooth and consistent, then the trigger breaks aroud 4.5# everytime. I have run Hiperfire, Geissele, and RRA, and I would take this trigger group. It is the best trigger for $150 on the market. I bought this to replace the stock trigger in my SR762, which had an average trigger pull of 9-lbs, 6-ozs, with a standard deviation of 8.4-ozs. This is a little heavy for my liking, and a little unpredictable on when it will break. With the Elite 452 trigger installed: The first stage travel ends at 3-lbs, 6-ozs, with about 3/16-inch of take up travel. The second stage breaks cleanly at an average of 4-lbs, 6-ozs, with a standard deviation of only 0.5-ozs, over ten tests. This is very predictable, and while still a bit heavier than I like is completely acceptable. It is well worth the money, and one of the best bargains in a trigger available for the AR platform. Some reviewers on here apparently cant tell the difference between creep and take-up. This is a two stage unit with light smooth take-up and a relatively crisp break. Ive had hands on three different units and all the trigger pulls were consistent with a total weight of right about the advertised 4.5 lbs. Maybe not quite as good as some of the match triggers which retail for $100 more, but a HUGE improvement over any standard GI i.e. any trigger which comes in a Ruger AR trigger pull. Just bought on of these and put it in my AR. VERY nice trigger. Gives my other drop in trigger some serious competition for nearly half the price. Dont hesitate to pick one up, you wont be disappointed. I wasnt! Keep the good stuff coming Ruger! I wanted a good 2 stage for my AR, assumed Ruger would be exemplary unit and ordered this I must admit that I was intrigued by the included dry fire housing too. Not so. Trigger breaks cleanly AFTER lots of creep. Barely better than a GI trigger group.